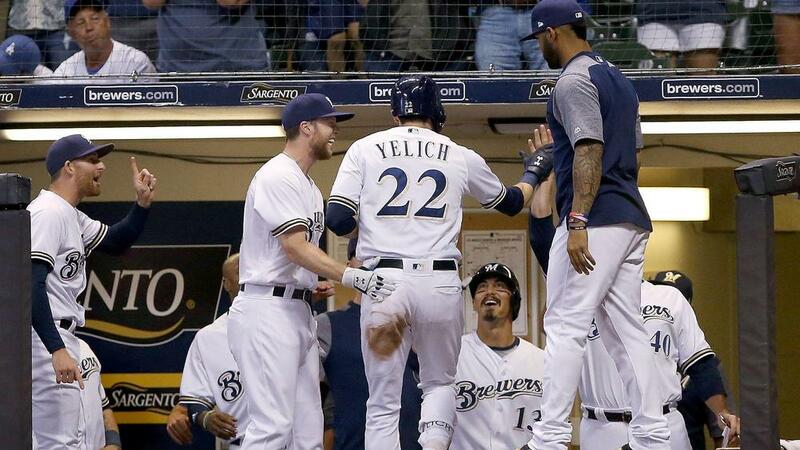 Milwaukee Brewers beat Los Angeles Dodgers 4-2 on Saturday at Miller Park to snap a seven-game losing streak. The Brewers' last win came on July 10 against the Miami Marlins and it did not look good for them again when Los Angeles took a 2-0 lead when Chris Taylor tallied a two-RBI single in the first inning. But Milwaukee manufactured a run in the second before bringing home three more in the bottom of the sixth to take the lead. The Brewers’ bullpen combined to pitch five innings of scoreless relief to secure the win. Dodgers ace Clayton Kershaw picked up the loss after he allowed four runs, but just one earned, in six innings of work. The win moves the Brewers to 56-44 on the year, while the Dodgers fall to 54-44. Matt Carpenter has now hit home runs in six successive games as the St. Louis Cardinals split their day-night double-header against the Chicago Cubs. The Cubs struck first with a 7-2 win in the opener, but Carpenter's homer and a three-run ninth inning helped the Cardinals hit back with a 6-3 triumph in the second meeting of the teams. Blue Jays starter Marcus Stroman allowed one run and struck out seven in seven innings on the mound against the Baltimore Orioles, helping Toronto record a 4-1 win. Yankees closer Aroldis Chapman allowed three earned runs and failed to record an out, yet his team still recorded a 7-6 win over the Mets. Chapman threw 11 straight balls and was booed off the mound at Yankee Stadium, though Chasen Shreve recorded the save after stepping coming into the game with the bases loaded. There was also a tough outing for Texas Rangers reliever Austin Bibens-Dirkx, who allowed 11 runs in four innings in a 16-3 loss to the Cleveland Indians. Tampa Bay Rays designated hitter Ji-Man Choi blasted a long home run in the bottom of the ninth but it was not enough to avoid defeat against the Miami Marlins. Choi's 460-foot drive cut the deficit to 3-2, but Kyle Barraclough recovered to earn his 10th save in 13 opportunities. The Mets and Yankees will conclude the Subway Series on Sunday. The Mets picked up a 7-5 win in the series opener, but the Yankees just about came away with a one-run triumph to level matters on Saturday. Ace Jacob deGrom (5-4, 1.68 ERA) is set to take the mound for the Mets while Masahiro Tanaka (7-2, 4.54) will start for the Yankees.